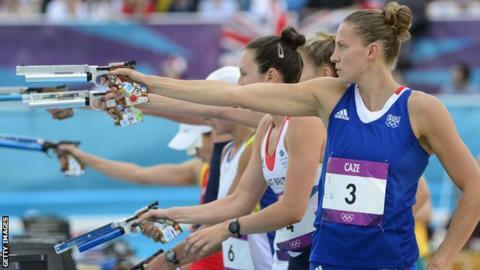 The modern pentathlon is one of several sports at risk of being dropped from future Olympics. Taekwondo, wrestling, badminton and table tennis are also thought to be fighting for survival from 2020. Members of the International Olympic Committee's executive board will decide on Tuesday which events will survive. The sport that is dropped will then be added to the shortlist of events seeking inclusion to the 2020 Games. That list includes baseball and softball, which have combined forces, along with squash, karate, sport climbing, wakeboarding, wushu and roller sports. BBC sports news correspondent Gordon Farquhar said: "The most vulnerable of the existing sports are thought to be Modern Pentathlon and Taekwondo." Great Britain's women have won a modern pentathlon medal at every Games since the event was opened to both sexes at Sydney 2000. Stephanie Cook won gold there with Kate Allenby taking bronze, and GB have taken three medals since, most recently when Samantha Murray picked up silver at London 2012. Great Britain's men last won a gold in the team discipline in Montreal in 1976. Their only other medal since then came in Seoul in 1988 when the team took bronze. The executive board will review a report assessing each of the sports contested at last summer's London Games. The report analyses more than 30 criteria, including television ratings, ticket sales, anti-doping policy and global participation and popularity. With no official rankings or recommendations contained in the report, the final decision by the 15-member executive board will likely be influenced by political, emotional and sentimental factors. "The most vulnerable of the existing sports are thought to be Modern Pentathlon and Taekwondo. If a sport is dropped, that's not the end of the story. The sport that's removed has the right to join the battle for inclusion again. It will take its place among seven other sports shortlisted as possibles, including squash and karate." Modern pentathlon is a tradition-steeped contest invented by the founder of the modern Olympics, French baron Pierre de Coubertin. It has been on the programme since the 1912 Stockholm Games, where George S Patton - a future famous US Army general - finished fifth. It combines fencing, horse riding, swimming, running and shooting - the five skills required of a 19th Century cavalry officer. Union International de Pentathlon Moderne president Klaus Schormann is keen to continue the legacy of De Coubertin. He said: "The Olympic movement always needs history. You cannot just say we look only at the future." The last sports removed from the Olympics were baseball and softball, voted out by the IOC in 2005 and off the program since the 2008 Beijing Games. Joining the programme at the 2016 Games in Rio de Janeiro will be golf and rugby union sevens. The IOC will decide in September whether Istanbul, Madrid or Tokyo will host the 2020 Games.